The ride back from NAMM is usually an uneventful straight shot up I-5 from Los Angeles towards San Francisco. But I found myself making good time, and in a mood for a bit of exploration – not to mention an opportunity to rack up more routes on my Highway☆ app – so I decided to try something different. I decided to follow California Highway 99 as it splits off from I-5. 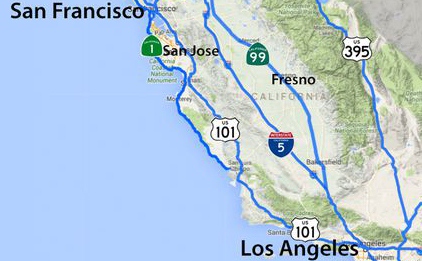 CA 99 takes a more easterly route than I-5 and connects to the major towns and cities of the Central Valley. 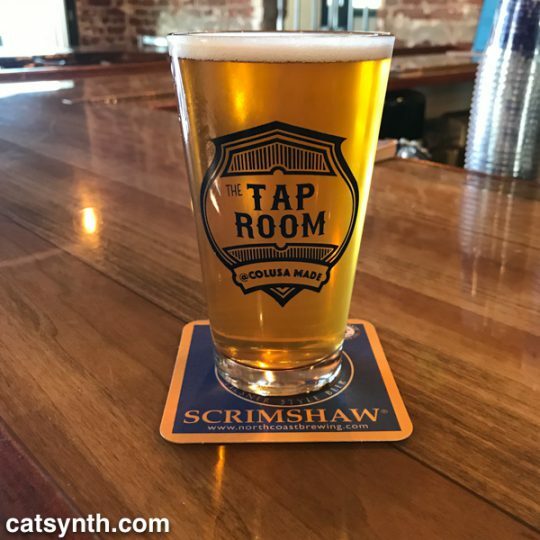 A stretch in the northern part of the Central Valley was featured in our recent CatSynth TV Episode 99, but the southern part largely remained unexplored outside the immediate vicinity of Bakersfield (where it intersects CA 58). So much of the highway was new. That southernmost section was, to put it bluntly, rather sad. The road is narrow, bumpy, and crowded. The landscape was dotted with a mixture of fields, run-down housing developments, and strip malls. And the sky was smoggy with an unhealthy yellow hue. But the afterglow of our most successful NAMM show to date along with the spirit of exploration gave a level of joy to the experience. 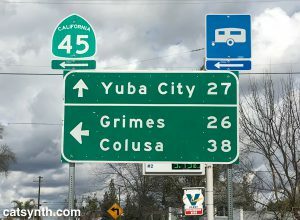 At Visalia, I decided to turn off and head west onto California Highway 198. If 99 was a bit of a cluttered and bumpy mess, 198 was the opposite: a pair of smooth straight lines cutting through farmland with sparse development. It began as an expressway but soon turned into a full-on freeway in Kings County as we headed toward Hanford and then on to Lemoore, where we intersected with Highway 41 in a major interchange. A few years ago, I had seen it from the perspective of Highway 41 and mentioned it a post at that time. There is something strangely fascinating about the island of small towns sitting at the northern edge of dry endorheic Lake Tulare. I can’t quite put my finger on it, but it is strong enough to inspire a story line and possible writing project that I work through in my mind when I have trouble sleeping at night. We will see if anything comes of it. Past Lemoore Naval Air Station, 198 narrows to a small two-lane route, and becomes significantly less interesting. My mind shifts to the story on the radio about people whose altruism goes to extreme lengths, including a man in India who founded and nurtured a growing community for people with leprosy while putting himself and his family (including two young children) at risk; and a couple who kept adopting more and more children while having less time and attention for their older biological and adopted children. These drives can be seen as incredibly caring and generous, but I also wondered if they were a bit pathological – indeed, the seeming lack of concern for others affected as they pursued their extreme altruism seemed to be mark of a sociopath. Heading west on the narrow section of CA 198, we approach Interstate 5 again. This is, however, a spot infamous to north-south travelers for its offending aroma. 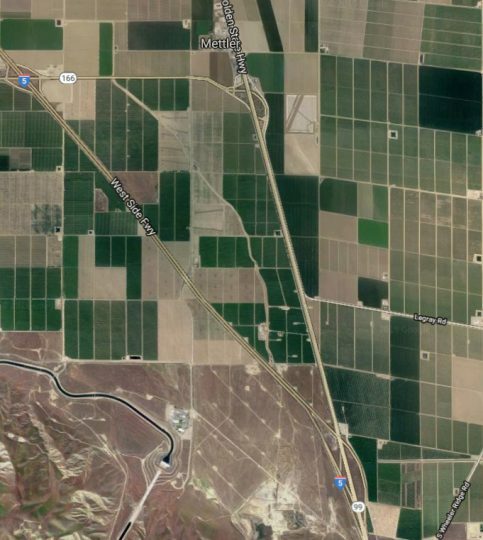 It turns out the infamous small at the Coalinga junction of I-5 and CA 198 comes from the gigantic Harris ranch and feedlot. It only got worse after turning north onto I-5, but soon enough it was behind me and a not-too-long road to San Francisco remained ahead. See more of California and many other fascinating places in our Highway☆ app, available on the Apple App Store and Google Play Store. It’s the 99th Episode of CatSynth TV, and we have a special treat for all our readers and videos. It combines many of our interests: synthesizers, cats, experimental music and film, and highways. Video shot along Highway 99 in California from Manteca through Stockton and heading towards Sacramento. Additional video and photography at CatSynth HQ in San Francisco. Guest appearances by Sam Sam and Big Merp. Original experimental synthesizer music by Amanda Chaudhary, based on melodies from “99 is not 100” by Moe! Staiano. 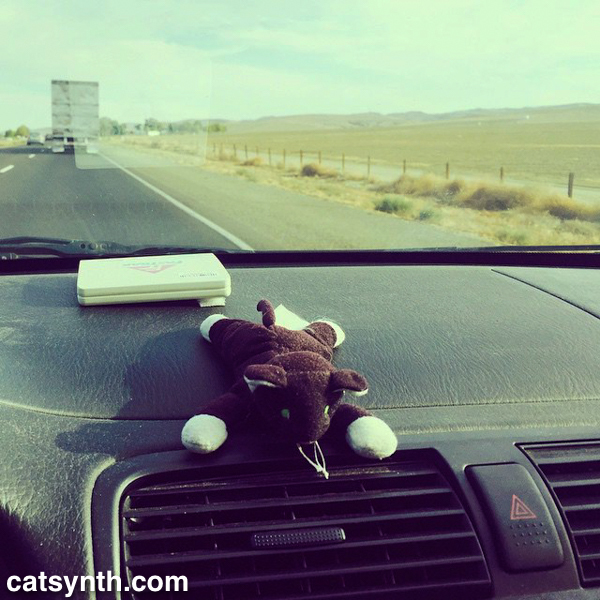 We at CatSynth love traveling and exploring our adopted home state. This includes day trips from the Bay Area as well as longer adventures. But one thing remains a bit of a challenge. For much of the state, the main highways are primarily north-south, with very few east-west routes. 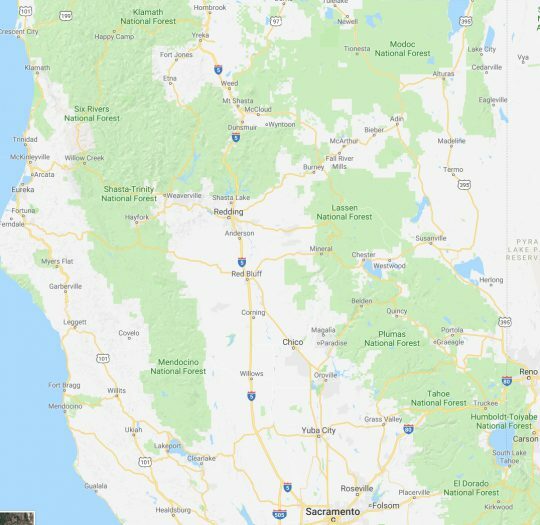 One chooses one of the long-haul north-south highways, California 1, US 101, I-5, California 99, or US 395 and is pretty much locked in with only a few options for efficiently traveling east to west. There is I-80 in the middle north, California 152 or California 46 from the coast through the Central Valley and California 58/I-40/I-15 further south. North of Sacramento, east-west travel becomes even more difficult, with routes like California 20 and California 299 being relatively rural and windy for much of their length. 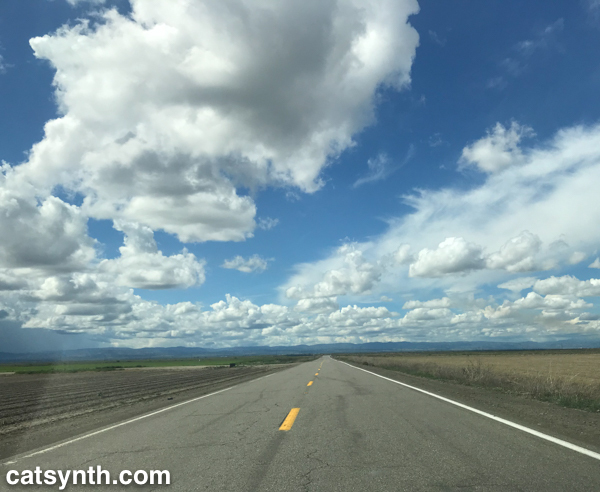 The end result is that most of our trips – especially single-day trips heading north – are forward and back along one of the main north-south routes unless we have extra time or necessity to use the smaller east-west roads. This north-south bias can be seen in an almost self-similar way when zooming in on the extended Bay Area. South of San Francisco, there is California 1, I-280, US 101, I-880, I-680 and then not much at all until one gets to I-5 in the Central Valley. 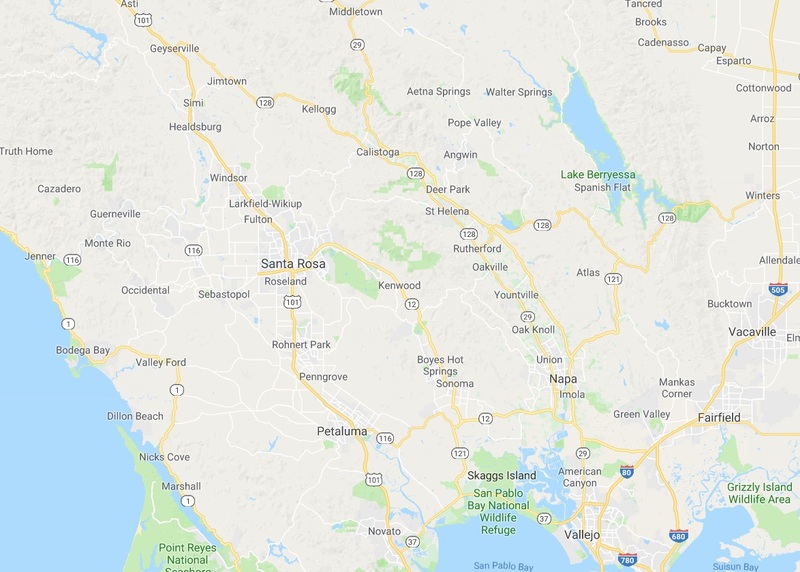 In the North Bay and wine country, a similar pattern appears with CA 1, US 101 and CA 29, with another large gap until I-505 and I-5. We have made use of east-west roads like CA 128 to get between them as in our recent wine-country trip that featured Elsie the Library Cat. But this is a long detour. This north-south axis may be frustrating at times (especially the further north one gets), but there is nothing particularly sinister about it. It’s all a matter of Calfornia’s geology. The interface of the Pacific and North American plates that give us our reputation for earthquakes also lead to long bands of north-south mountain ranges and valleys. The Sierra Nevada may be the most dramatic, but it is only one of several that form vertical stripes, with the Central, Sacramento, Salinas, and Napa valleys in between. The San Francisco Bay can be seen as another such valley in a way, with shallows bounded by high hills running north-south. The exception to the “north-south rule” can be found south of the San Gabrial mountains and into the desert. From Los Angeles and San Diego, one can easily travel east-west to the desert towns and to the Arizona border on I-10 and I-8, with a network of other east-west freeways in between. It is definitely a different experience traveling down there once one gets over the Grapevine or the Tehachapi Pass and into the southern realms. As for the rest of the state, there is no escaping the geographic reality, so it is best to embrace it, and even enjoy it. A few years ago, I traveled California’s Highway 41 on my 41st birthday. I had hoped to make this a regular tradition, but various circumstances have kept me from following through, until this year, when I drove the southern half of California Highway 45. It wasn’t exactly on my birthday, and I didn’t complete the route, but was still a fun and eccentric way to celebrate the conclusion of my 45th year of life. It was also a good excuse to try out the new travel-mapping feature in our Highway☆ mobile app. 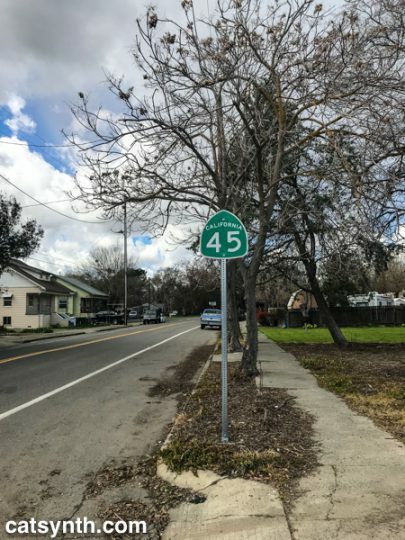 Highway 45 begins in the small town of Knight’s Landing in Yolo County, so I first had to schlep up there via Interstate 80 and then turn north on Highway 113 near U.C. Davis. 113 is a major freeway at this point, but a bit further north it narrows to a two-lane country road before reaching the junction with 45. Knight’s Landing was actually a very small but cute town along the Sacramento River. 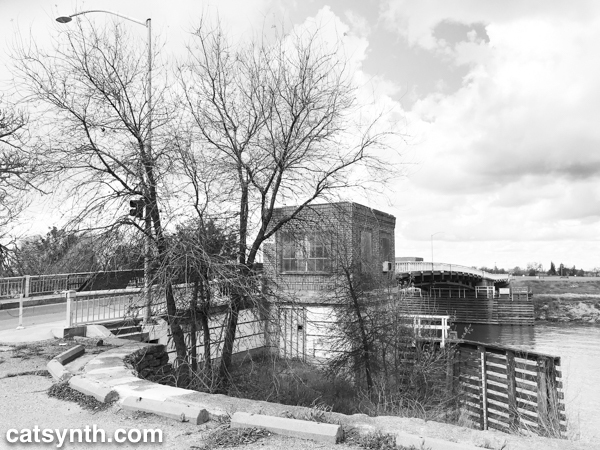 Before embarking on the formal part of the trip, I stopped along the levee at Front Street to view the continuation of Highway 113 across the river. Front Street was rather beaten up compared to the rest of the town center, perhaps due to the nature of the levee or to discourage unnecessary driving, but it made for a nice little walk. I then returned to the car and finally turned onto Highway 45, heading northwest out of town. The highway zig-zagged on a grid between fields on the western side of the Sacramento River, but far enough for the river to mostly remain out of sight. But there were some lovely wide-open farmland vistas, made more dramatic by the bands of clouds in the sky marking what was a lovely day after a week of dreary weather. It is when the landscape opened up that I was able to fully relax into the trip. There is always a point along the journey during which stresses, mundane or otherwise, start to melt away and the road, landscape, and solitude take over the mind. 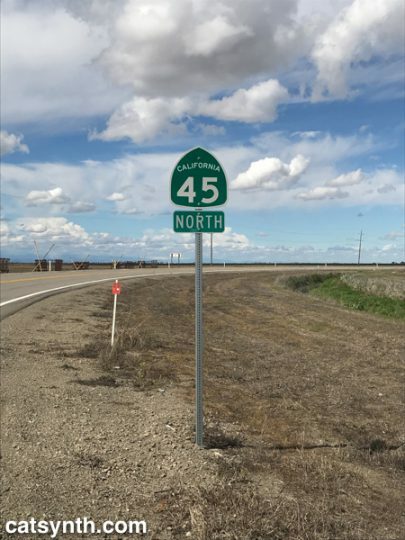 As Highway 45 is remarkably well signed, there was no ambiguity or uncertainty. The result is a sense of flow and well being that allows one to both think about other ideas, like music, while remaining fully engaged in the moment. It is something I have experienced many walking the streets of San Francisco, but not lately. I certainly hope it isn’t gone – as much as I enjoy these long excursions to other regions, I would love to return to the sense of external flow in my own community as well. Perhaps it is the familiarity or the many stresses and dramas, but I hope to regain it. 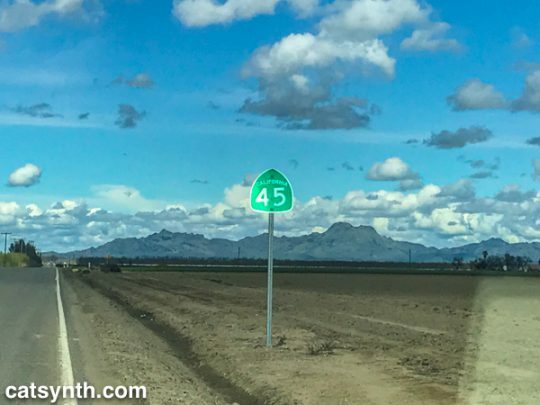 The highway turned due north in Colusa County, providing great views of the Sutter Buttes, considered to be one of the worlds smallest mountain rangers. At this point, Highway 45 comes closer to the river, and between Grand Island and Grimes, comes right up against levees, before turning north again. It is not surprising to see such high levees, as the entire region seems like a giant flood waiting to happen. 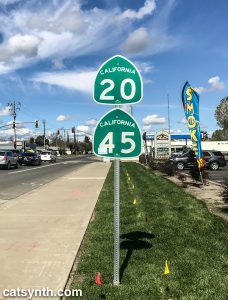 Further north, we join with California Highway 20, a major east-west highway in this rural part of the state connecting to Yuba City to the east and to Lake County far to the west. The road became wider, smoother, and significantly busier as we continued on the duplex into the town of Colusa. Colusa is a picturesque town on the river, with a small but nice town center and a quiet park along the levee and riverbank. It had warmed up considerably since I last got out in Knight’s Landing, so stopped for a bit to enjoy the sight and sound of the river. You can see a bit in this Instagram video. Nearby I found The Tap Room, a small pub that had a large selection of beers including some local brews. I don’t think they had Sutter Butte Brewing, but they did have some selections from Berryessa brewing including this IPA. In the enjoyment of the trip, I had completely forgotten that it was St. Patrick’s Day. But I was quickly reminded by the bartender who was decked in bright green regalia and informed me of the holiday pub crawl that would be happening that evening. This was the talk of the local patrons who started trickling in as the afternoon wore on. Everyone was friendly and welcoming, but a night of drinking was not going to be compatible with my plan to get back to the city safely at a reasonable hour. So I bid farewell and headed out on Highway 20 back to I-5 and I-505 to return to the Bay Area. Tired but accomplished, I crossed the Bay Bridge back into San Francisco and home later that evening. That would usually be the end of the story, but after resting, we made the last-minute decision to go out again that night. So I found myself getting dressed up and heading back over the bridge for the third time to Oakland to see Chrome with Helios Creed. We met up with quite a few friends at the show and had a great time. You can see a bit of Chrome’s performance in this CatSynth TV. 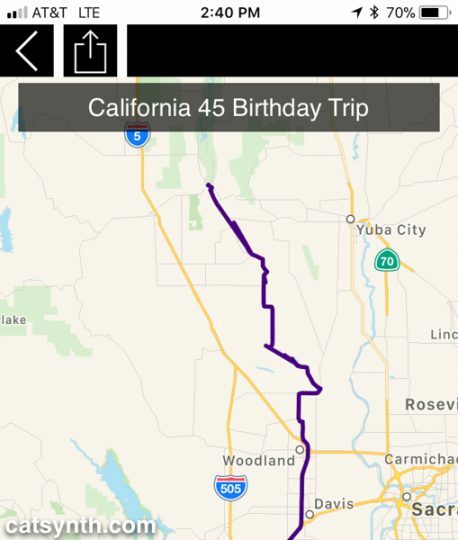 See more Northern California in our Highway☆ app, available on the Apple App Store and Google Play Store. At least since 2010, all of my trips to NAMM have been road trips, heading east from San Francisco on I-580 to meet Interstate 5 for the long trek south through Los Angeles to Orange County. 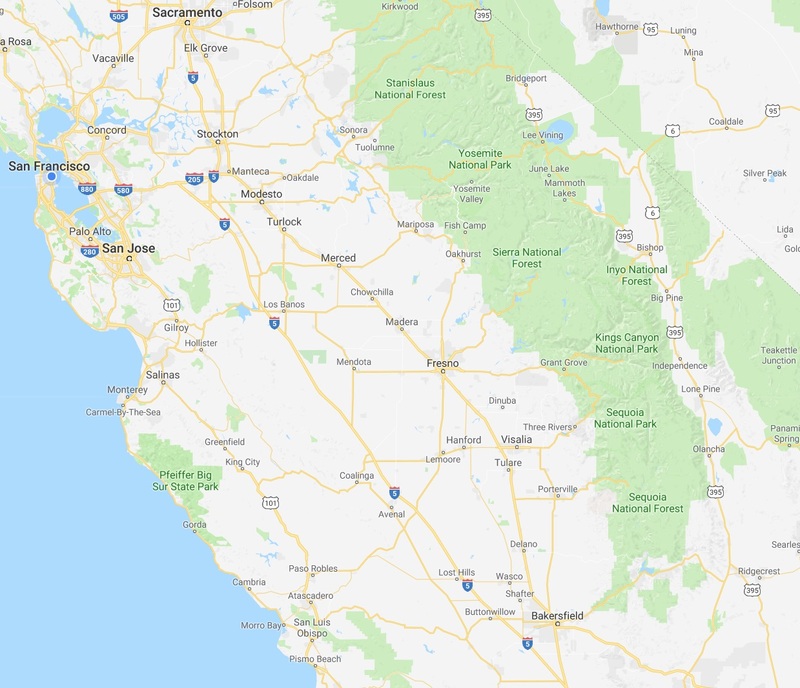 I-5 takes a more direct route through the sparsely populated western side of the Central Valley, compared to CA 99 (former US 99) that connects the major towns and cities of the region, including Fresno and Bakersfield. 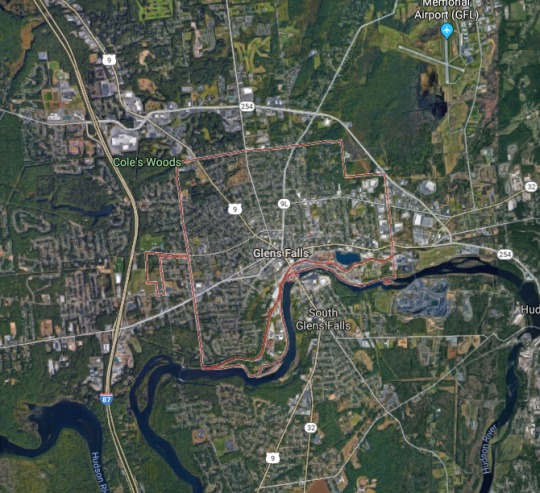 The small communities that one does pass are related to travel on the interstate itself or to the farms and orchards that dominate the landscape between stretches of emptier space. It is a long trip, and one that I know many people would find boring. But for me, it is something I look forward to, an integral part of the experience along with the show itself, the after-parties and all the other little adventures. This year there was the added fun of testing out Highway☆ on the road trip, but even without that heightened sense of purpose, it is simply an enjoyable “flow experience.” Once over the Altamont Pass and into the Central Valley, stresses begin to fade as the mostly straight line of the road and the low stimulation of I-5 takes over. It may seem “empty” but there is still is just enough detail along the route to provide balance. After many years, I have come to know just about every major junction and many of the other details, such as the names of the small communities along the highway. By the time I arrive in the Los Angeles basin, I am recharged, enough to even remain unfazed by the notorious traffic! The return trip along a nearly identical route is similarly an opportunity for psychic calm and flow after the nonstop overstimulation of NAMM (I do spend a half day after the show either with friends or at a museum as part of the decompression process before getting back on “The 5”). This year was no different, as I headed back with a tailwind and sense of optimism. Life seemed calm, free, but also filled with curiosity and excitement about professional opportunities in technology, music, and even travel. That feeling lasted into our arrival back in San Francisco, at least until my second bout of this year’s awful flu kicked in, along with some other stressful local responsibilities. One of the mental exercises to help through the ensuing week was to focus on how my mind and body responded positively to the I-5 trip (and to the many tendrils of travel in and around L.A.) and thought experiments on how to capture that sense of enjoyment and calm even when not traveling down a straight and empty stretch of road. I come back again to flow experience and how much that seems to be a product of solitude for me, but it can also come in playing together with musicians at the highest levels. And then there are situations where flow is stymied or non-existent. It is important to recognize both, and I hope to explore these topics more in upcoming articles. See more of Interstate 5 in California and many other fine places across North America in our Highway☆ app, available on the Apple App Store and Google Play Store. With Pittsburgh in the news, perhaps for all the wrong reasons, we thought we would have a little fun exploring what the city has to offer. The city is located at the convergence of the Allegheny and Monongahela Rivers, which merge to form the mighty Ohio River. This was a fact we learned young with the frequent appearances of Three Rivers Stadium on TV and the subsequent challenges to name the three rivers. For whatever reason, Allegheny was the hardest to remember. The downtown is wedged between the two upper rivers and enveloped by a network of highways including I-279, I-376, I-579 and PA 28. In this early-morning photo, we are looking across the Monongahela River, with I-376 along the shore and the skyscrapers of downtown behind it. As a city of rivers, it also becomes a city of bridges. The Pittsburgh of 2017 (even the Pittsburgh of 1997) is far distant from its industrial past as a center of steel, coal and many other manufactured materials. This history does live on in many circa-1900 houses and buildings, and the ubiquitous presence of Andrew Carnegie. Perhaps the most significant of his legacies to the city is Carnegie Mellon University. It has one of the top Computer Science departments, and one of the first Robotics departments. But the university is also a leader in combining science and art. They recently became the one of the first universities to offer an integrated practice in robots and performing arts; and I have collaborated with professors and students in computer music, including Roger Dannenburg, whose work on managing time in computer-music systems influenced my own research on the topic. CMU is located far to the east of downtown. Among the sons of Pittsburgh is Andy Warhol, love him or hate him, he was a major influence on American art in the late 20th century. The Andy Warhol Museum sits on the north shore of the Allegheny, not far from I-279 and PA 28. There is even an Andy Warhol Bridge! Like my home cities of San Francisco and New York, many of the city streets in hilly Pittsburg are actually staircases, which sound like a lot of fun to explore. One can take official walking tours, or simply wander (as I often prefer myself). We would be remiss if we did not also give a shout-out to our friends at Pittsburgh Modular Synthesizers. We have several of their modules, which feature a classic mid-century design aesthetic. (They also include space-themed cards and tchotchkes in each box.) You can read our many posts featuring Pittsburgh Modular synths, sometimes with cats. We at CatSynth hope to visit the city sometime soon. See more of Pittsburgh and many other fine cities in our Highway☆ app, available on the Apple App Store. Highway☆ Released on the App Store! We at CatSynth are excited to announce the release of our newest app Highway☆ for iPhone and iPad, available on the App Store! This app comes out of long-term interest in highways and road travel, something we explore periodically on this site. It’s a sort of “Pokemon Go” for travelers and road geeks, where you can discovery and collect highways as you travel. It also has features for exploring new places on your device, and finding more information about the roads. You can also connect with other users and compete for the top scores. And we are currently busy at work on an Android version, which we hope to share soon. At the southern edge of Los Angeles County lies the Ports of Los Angeles and Long Beach, the two largest and busiest in the United States. They are in some ways an entire separate city, with their own network of bridges and freeways beyond the regular network of Los Angeles and its environs. We begin our exploration in a quiet and somewhat industrial section of Long Beach along Willow Road. Seemingly in the middle of nowhere, we encounter the northern California Highway 103, the Terminal Island Freeway which is a major truck route to the port. It might be the heavy truck traffic that accounts for its being in rather poor shape. Heading south on CA 103, we pass through a flat, industrial landscape. It is a bit desolate, but beautiful in its way. There are only two interchanges, one of which is with CA 1. Continuing past the interchanges, the freeway transitions to California Highway 47 and crosses the Cerritos Channel to Terminal Island the ports on the Commodore Schuyler F. Heim Bridge. This is a massive lift bridge that can accommodate large ships accessing the port. It has an old industrial and dystopian feel to its architecture, particularly on the foggy morning when I visited. Since then, the bridge has been decommissioned and is in the process of being replaced. I left the freeway at New Dock Street to get a closer look and to take more photos of the bridge and other details of the ports. Photographing around the working port has its challenges with a great many areas fenced off, and a no doubt a heightened suspicion of odd people wandering around with cameras. I did get a few, some of which are shared here. They have also appeared in Wordless Wednesday posts (and will continue to do so). CA 47 turns onto the Seaside Freeway runs east-west and bisects Terminal Island. Heading east, the freeway (also known as Ocean Boulevard) the graceful Gerald Desmond Bridge, becoming I-710 heading north through Long Beach. You can read about our separate adventure along I-710 is this article. Following CA 47 west along the freeway, one winds up and down between elevated and surface sections before ascending to the photogenic Vincent Thomas Bridge. There is a small park on the west side of the bridge, which affords one a change to get out, walk, and view both the bridge and the channel. There are families and others here, many probably from the adjacent community of San Pedro. We have in an instant left the industrial landscape of the port and entered the residential landscape of greater Los Angeles. It is appropriate the CA 47 ends here and the freeway turns north as I-110, the Harbor Freeway. But that is a story for another time.